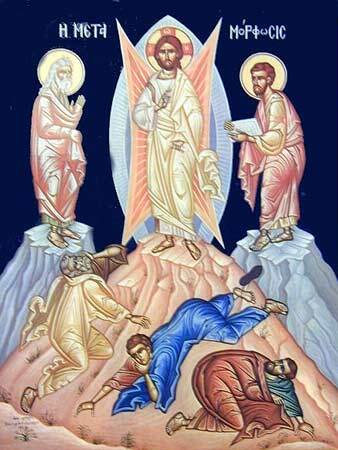 Ukrainian Lutherans celebrate Transfiguration of our Lord Jesus Christ on August 19. This is a custom of all local Ukrainian churches that follow Julian Calendar. However, this difference in dates does not change the message the Ukrainian Lutheran Church brings to people along with all the Confessional Lutheran Churches around the globe that celebrate this event in the life of the Church and her Lord at the end of Epiphany season: the Only-Begotten, eternal and glorious Son of God chose death and resurrection for the sake of His Church that consists of all the believers, both in the Old Testament and New Testament times. So far all the information is old. Soon information will be updated and changed. Renewal of the web-site became possible thanks to the Barnabas Project created and promoted by Pastor Neal Schroeder (WELS, Divine Peace Lutheran Church, Renton, Washington). 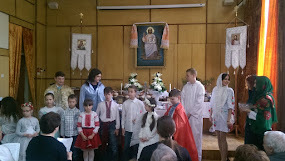 Pastor Neal Schroeder from the Divine Peace Lutheran Churh (Renton WA), has visited Ukraine, teaching VBS at the Holy Trinity Lutheran Church (ULC) in Kam'yanets Podilskiy. His assistant in that sucessful school was Silah Elmkvist, a WELS student from the United States. After the VBS was finished Pastor Schroeder and Silah Elmkvist have taught the Word of God to children at the sea-camp near Odesa. 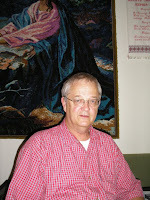 At the end of July Pastor Schroeder has been providing Christian advice and encouragement to Ukrainian Lutherans in Kyiv. Pastor Schroeder's activities in creating and promoting Barnabas Project have helped ULC workers to survive under very difficult circumstances that have been in Ukraine for the last year. Barnaba's project has been also very instrumental in ULC evangelism in Kyiv. Thousands of people in Kyiv can hear "Light for My Path" FM radio program supported by donations given by God's people to Barnabas project. The Lord responds to evangelism by sending new visitors in our church. We hope and pray the Lord Holy Spirit will create and sustain saving faith in those people through the means of grace. We thank the Lord for His faithful servant Neal and all the people who support the Barnabas Project. Soli Deo gloria!